The FAST (focused assessment with sonography for trauma) exam is a common application of ultrasound in trauma to identify intraabdominal and intrathoracic injury. The right upper quadrant view is the most sensitive. How important is the left upper quadrant view? 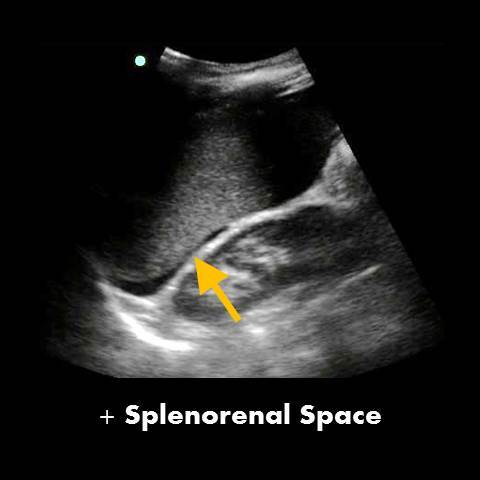 There are really three places where free fluid can potentially collect in the left upper quadrant - the subphrenic space (between spleen and diaphragm), splenorenal recess (between spleen and kidney), and left paracolic gutter (inferior to spleen). How often is the left upper quadrant positive without free fluid seen in the other two intraabdominal spaces of the FAST exam (bladder, RUQ)? What is the predominant location of the free fluid in the left upper quadrant? All EM attending physicians at the sites were credentialed to perform FAST exams. FAST was performed by residents and attendings of variable experience. No specific training for the study (since retrospective). All patients had FAST exam performed. 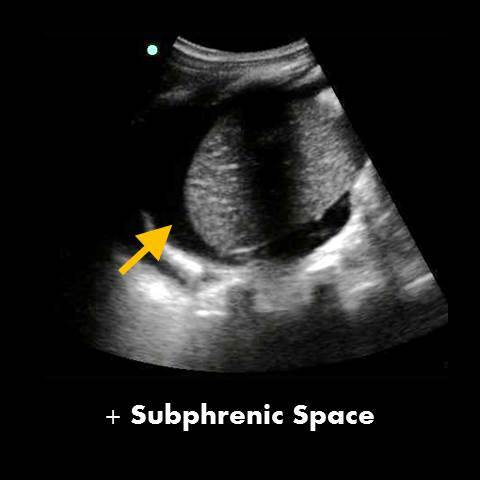 Subphrenic - between diaphragm and spleen. Traditionally taught as most sensitive. Splenorenal - between spleen and left kidney. Traditionally taught as low yield. Left paracolic gutter - inferior to spleen. Traditionally neglected. 1. 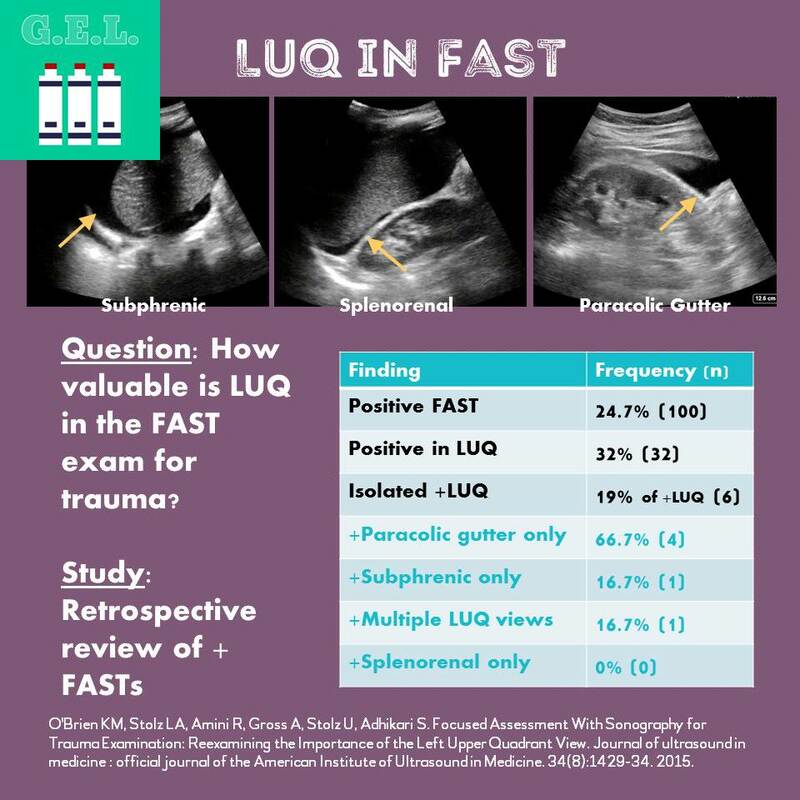 In this study, LUQ was the only positive part of the FAST 6% of the time. 2. 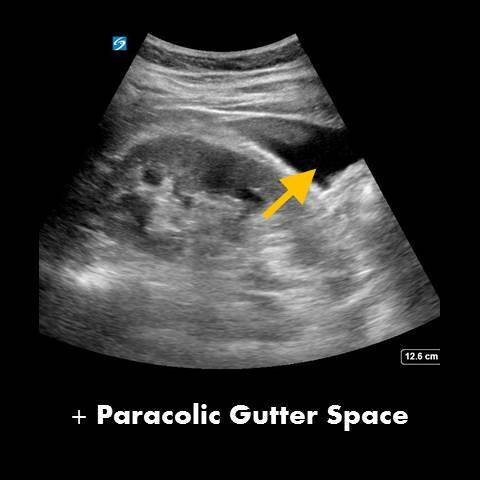 Although small sample, most common space for LUQ free fluid was left paracolic gutter.